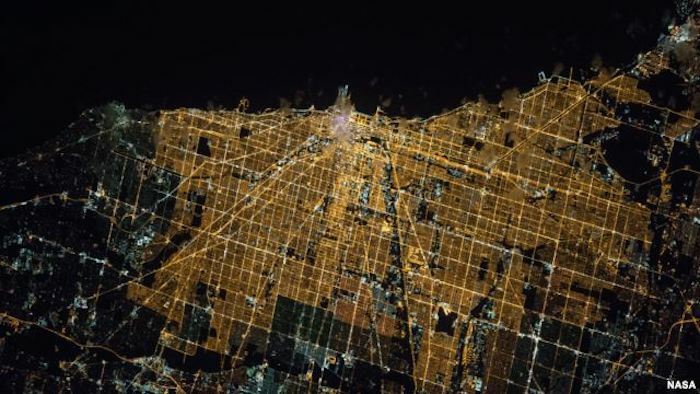 Expedition 47 Commander Tim Kopra of NASA captured this brightly lit night image of the city of Chicago on April 5, 2016, from the International Space Station. Kopra (@astro_tim) wrote, "#Goodnight #Chicago from @Space_Station. #CitiesFromSpace"
While many Americans celebrate May 5 as Cinco de Mayo, the anniversary of a Mexican military victory, science nerds recognize the date as a technological milestone: the day the United States first put a man into space. In 1961, the year astronaut Alan Shepard Jr. made his milestone 15-minute flight, hysteria about the U.S.- Soviet Union space race was in full swing. Russia had already put a man in orbit and had launched the world's first artificial satellite, the Sputnik 1, in 1957, igniting fears that the United States was losing its status as the dominant world power. The United States quickly assembled scientific teams that had been working on space travel; the race to achieve the first manned spaceflight was on. The new U.S. space agency was named the National Aeronautics and Space Administration, or NASA, and the manned spaceflight program was named the Mercury Project, after the Roman god of swift travel and transit between worlds. 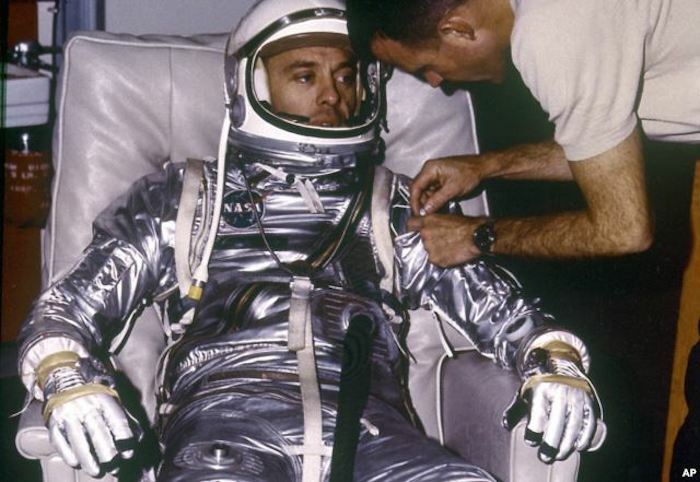 1961: Astronaut Alan B. Shepard, Jr. during suiting for the first manned suborbital flight, MR-3 mission. The Freedom 7 spacecraft, carrying the first American, Astronaut Shepard and boosted by the Mercury-Redstone launch vehicle, lifted off on May 5, 1961. Shepard, a U.S. Navy commander who had experience with aircraft test flights, was selected to pilot the first manned Mercury spacecraft. He wrote later that when he informed his wife he had been selected to become the first American to travel to space, she quipped: "Who let a Russian in here?" But her presumption was right. Soviet Cosmonaut Yuri Gagarin beat Shepard into space by one month, manning the Vostok 1 as it made one orbit around the earth April 12, 1961. Shepard made his own historic journey three weeks later, in a less spectacular journey that went only 187 kilometers above the Earth and lasted only 15 minutes. But it was seen as an important milestone as the United States strove to catch up to its Cold War rival in technological innovation. The competition continued throughout the 1960s, finally culminating with the U.S. moon landing on July 20, 1969. Shepard made his own journey to the moon on the third Apollo mission in 1971. Despite being one of the best known names in U.S. space travel, Shepard flew only two missions. In the four decades between Shepard's last spaceflight, much has changed between the United States and its onetime rival in space. With the 1998 launch of the International Space Station, pushing further into space has become a collaborative effort, including not just the United States and Russia, but also the European Union, China, and Japan. Over the years, at least 222 spaceflight technicians from 18 countries have worked together on long-term projects as they orbit the Earth every 90 minutes. 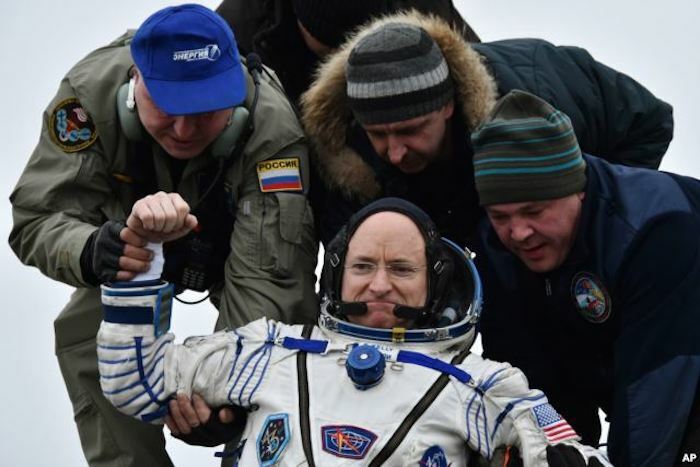 FILE - Ground personnel help International Space Station (ISS) crew member Scott Kelly of the U.S. to get off the Soyuz TMA-18M space capsule after landing near the town of Dzhezkazgan, Kazakhstan on March 2, 2016. In March of this year, U.S. Astronaut Scott Kelly returned from a one-year assignment in orbit on the space station as NASA scientists monitored the effects of long-term space travel on the human body. During that time his identical twin, former Astronaut Mark Kelly, acted as a control subject on Earth. NASA plans to monitor both men for the next year as it prepares for a new era of space exploration -- one in which private industry plays a role. Since the U.S. space shuttle program ended in 2011, the United States has depended on Russia for transportation to and from the space station on the Soyuz spacecraft — a mind-boggling reversal from the early, competitive days of space travel. But NASA has said it hopes to transfer that role to private U.S. companies as they develop suitable spacecraft. Several U.S. companies are working on just that. Today, the private firm SpaceX landed a rocket on an ocean platform for the second time, a signal that private industry is drawing nearer to becoming a major player in what has become a global space industry. Its goal is to develop rockets that can be used for multiple launches rather than discarded after one use, as has been the standard in the past. SpaceX cofounder Elon Musk has said reusable rockets could greatly reduce the cost of space travel. Musk swiftly shared his elation over the successful launch and recovery Friday with a tweet on social media, saying only "Woo-hoo!" He soon followed that message with one saying "May need to increase size of rocket storage hangar," meaning SpaceX would soon be storing its rockets rather than disposing of them. Now, with the success of the space station, international collaboration is expected to continue as scientists pursue their next goal: the planet Mars. 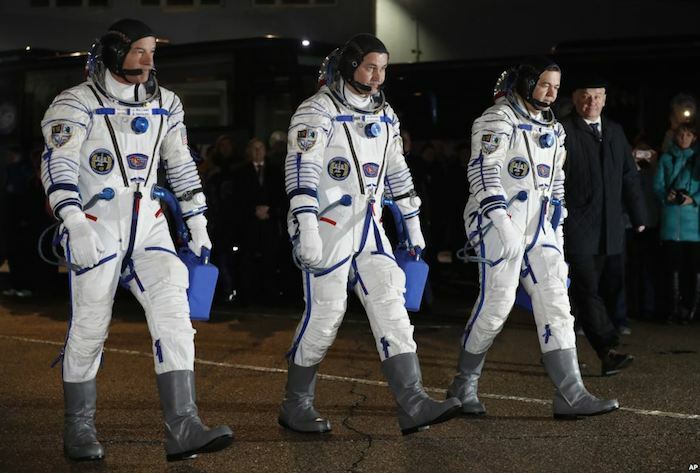 From left: NASA astronaut Jeff Williams, Russian cosmonauts Alexei Ovchinin, and Oleg Skripochka of Roscosmos, members of the main crew of the expedition to the International Space Station (ISS), March 19, 2016. In March, the Russian space agency, Roscosmos, and the European Space Agency launched a robotic exploratory mission meant to land on Mars in October. Private industry is not far behind: SpaceX has also declared its intention to send a craft to the red planet as soon as 2018. And U.S. President Barack Obama announced in 2010 that the U.S. hopes to send manned missions to Mars by the 2030s. Over a half-century, what began as a struggle for dominance between two world powers has changed entirely. Limited space and resources may continue to cause tensions here on Earth, but the search for something beyond our planet is one common goal that helps preserve peace.